The flavors of sweet, salty and creamy all come together in this quick and easy appetizer that is perfect for entertaining. Mixing it up with some hors d’oeuvres-y things today! Because, I mean, what are the holidays without some delicious appetizers to snack on throughout the day? 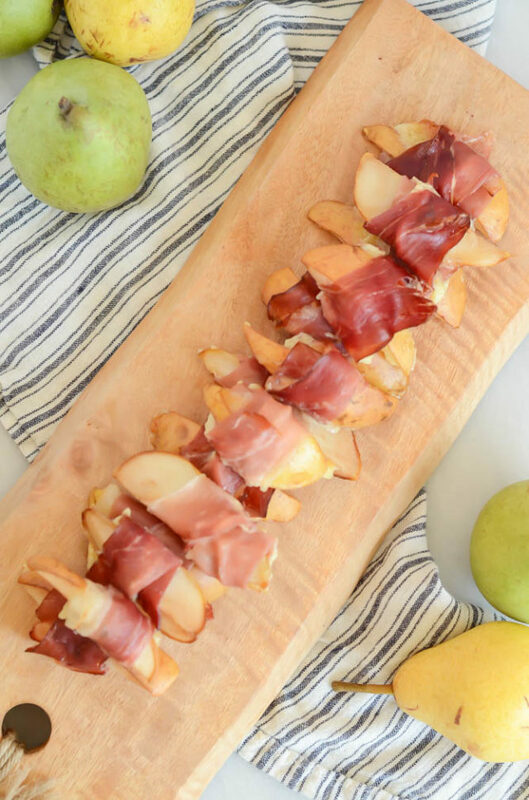 These Prosciutto-Wrapped Pears with Creamy Blue Cheese are certainly topping my list of delicious bites to get me through the day RN, especially as an extra-hungry breastfeeding mom. It doesn’t hurt that I am also completely reveling in the fact that I can enjoy charcuterie and moldy, stinky cheeses again! 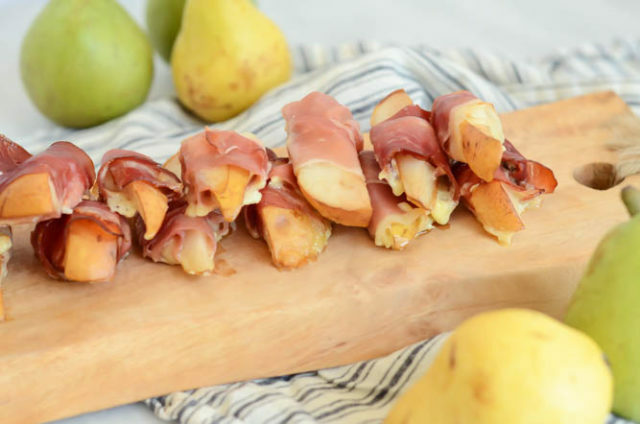 Yes, these Prosciutto-Wrapped Pears do involve some pungent, creamy blue cheese (my favorite) but I do understand that not everyone is as freaky about stinky cheese as I am. That being said, you could easily sub in something a bit mellower like brie or even your favorite hard cheese. 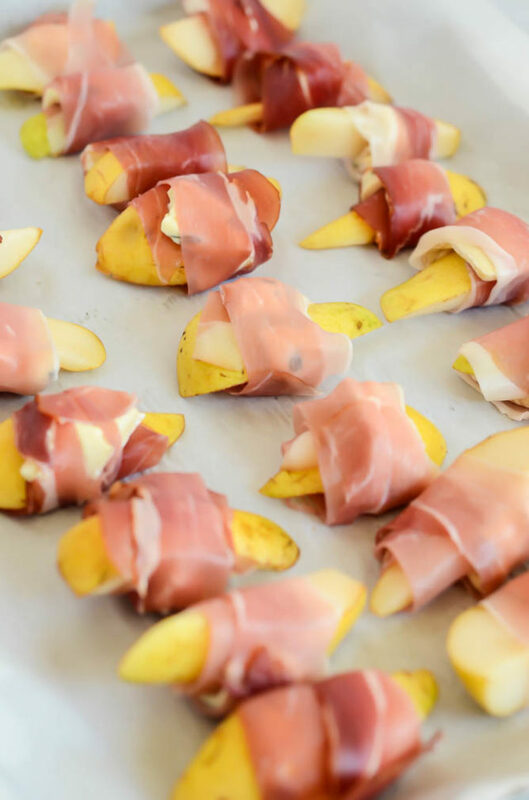 Just do me a solid and try the prosciutto-pear-cheese combo roasted up in the oven ASAP…You won’t be sorry! I have always been a fan of fruit and cheese. After all, we’re all about balance here on this site and mixing in some fresh fruit with sometimes slightly more indulgent (although still arguably with some health benefits) cheese is a great way to cut back on the crackers and breads and get in some extra fiber and nutrients at the same time. A win-win in my book! 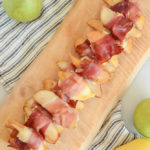 In fact, you can rarely find my entire family getting together for any sort of occasion without some sort of cheese and charcuterie selection making an appearance, so you can bet these Prosciutto-Wrapped Pears with Creamy Blue Cheese will be one of our hors d’oeuvres selections for Thanksgiving, Christmas and more! So let’s talk about the recipe for a minute. 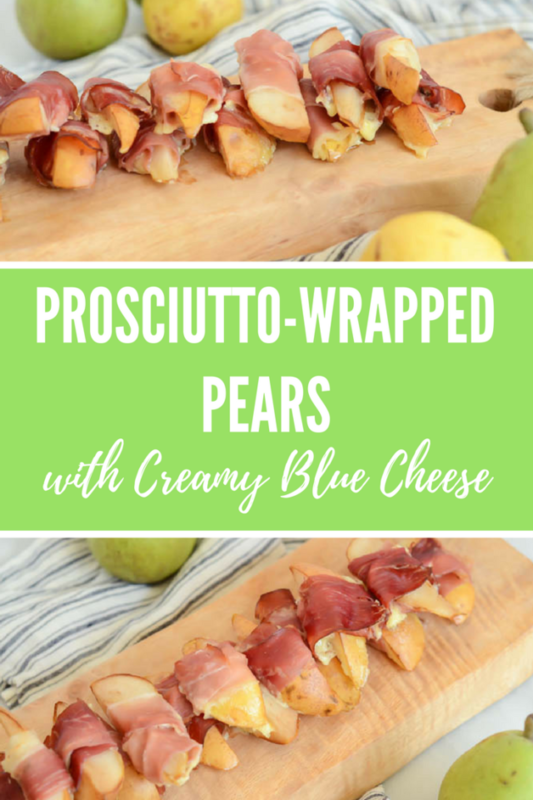 I decided to bake said Prosciutto-Wrapped Pears with Creamy Blue Cheese to give the pears a nice roast-y flavor and the prosciutto a little crispy crunch, but I’d be lying if I told you it didn’t end up being a little messy. That being said, if you love warm, oozy, roasted hors d’oeuvres, definitely give these babies their time to shine in the oven. But, if you’d rather keep things neat and simple (and also leave room for more important things, like a roasted bird or green bean casserole, in the oven) than it’s perfectly acceptable to serve these uncooked as well. 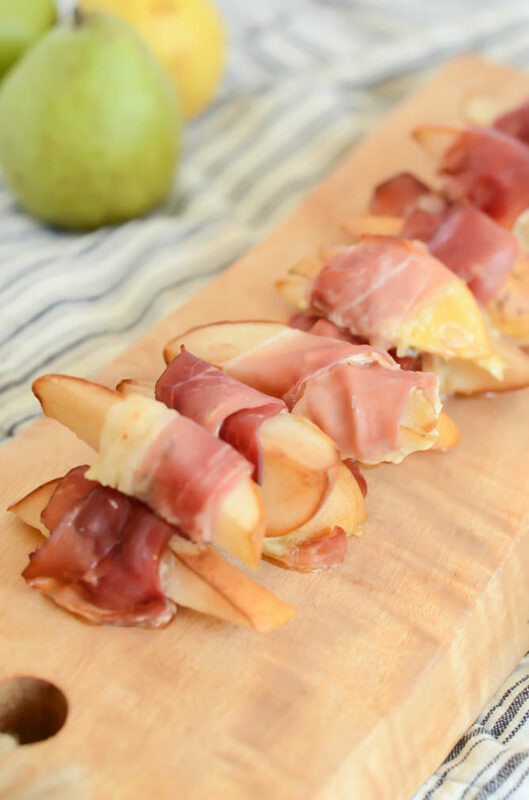 Tell me, besides making these Prosciutto-Wrapped Pears with Creamy Blue Cheese, what are your plans for Thanksgiving? Are you traveling to visit family and friends or staying put and entertaining on your own at home? We’re gathering up the babe and headed up to NorCal on our first road trip with her. So far our game plan is to just take things slow and stop when needed (it’s normally about a four-hour drive) but I’d love to hear any suggestions you have for taking a newborn on a long car ride. I hope you have a wonderful week filled with lots of delicious food! Preheat oven to 375 degrees Fahrenheit and line a jelly roll pan with aluminum foil. Take one strip of prosciutto and spread on a small amount of creamy blue cheese. Wrap around a slice of pear and place on baking sheet. Repeat this process with the rest of the pear wedges. Roast in the oven for 5-10 minutes, or until the prosciutto looks slightly crispy and the pears slightly roasted. Let cool at least 5 minutes before serving. You can also just assemble the pears and skip the roasting part for an even easier method!